Studies describe subtalar and ankle arthrodesis as a factor altering the biomechanics of the foot during walking [1–3] whereas postural control appears physiological . Furthermore, foot orthoses (FOs) are also recognized for their actions on dynamics  and balance  but not for their postural impact on an isolated subtalar arthrodesis (ISA). 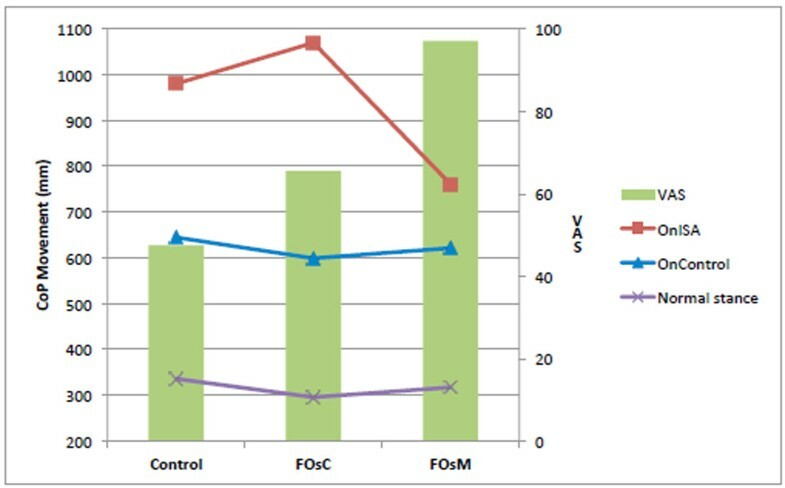 Previous studies have shown that depending on the type of FOs  and along the comfort felt by the subject , the variations induced by different FOs were significantly different. The aim of this study was to compare effects of different types of FOs on balance of patients with an ISA. Two subjects with ISA were volunteers for one session of three repeated measures: without FOs (Control), with Classical FOs (FOsC) and with Molded FOs (FOsM). After a clinical examination, these two types of FOs are custom-made including same posting. We compared postural variations through a force platform with shoes. Three modalities have been demanded at each measure: Normal stance, One-leg stance on the ISA (OnISA) and One-leg stance on the control foot (OnControl). Three data’s have been compared: Center of Pressure Area (CoP), CoP Movement (MoV) and Mean Velocity (Vel). The perception of comfort was evaluated by using previously established footwear comfort measures : 100mm visual analog scale (VAS). Using the VAS, subjects didn’t feel a real comfort in their shoes without FOs (VAS=47,5mm). FOs increased VAS (>17,9mm). Thus, FOsM were perceived as significantly more comfortable than FOsC, respectively 97mm and 65,5mm. Postural assessment showed the CoP (Figure 1), the MoV (Figure 2) and the Vel (Figure 3) were improved by both FOs with Normal stance. For OnISA, the data’s indicate postural control was significantly altered by FOsC and improved by FOsM. 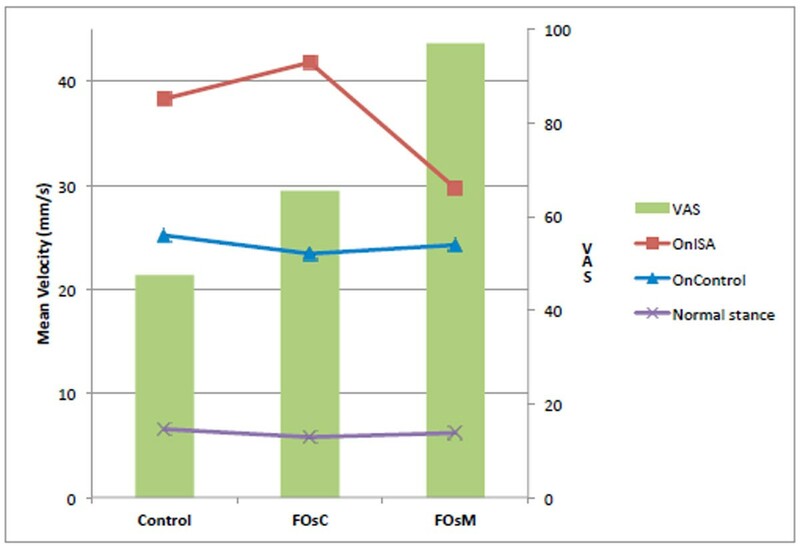 For OnControl, postural control was more improved by FOsC. FOs induced different effects on the balance of subjects with ISA depending on orthoses type and parameters observed. 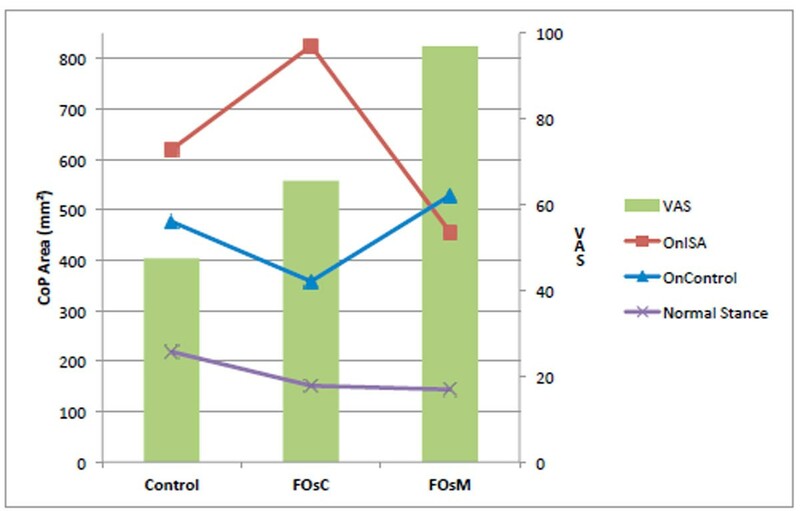 FOsM appear as clearly preferable to improve postural control on an ISA. The comfort is significantly improved by FOs and much more by FOsM. The data suggests correlations between improvement of balance and perception of comfort for patients with an ISA.